Dr. Gary Chapman says that each of us has a preferred love language- a way in which we best receive the love of those around us- a way that best speaks to our hearts. Some of us feel loved when someone shares quality time with us. Others feel loved when they receive thoughtful gifts. Many relish in words of affirmation, while others don’t care about any of that and would much prefer a warm hug, snuggling on the couch, or some other sort of physical touch. Still others feel truly loved when someone performs a thoughtful act of service. Do you know which you’d prefer? Often, the way we prefer to receive love is the way in which we convey our love, BUT those we love may not be receiving the love that we’re sending. Perhaps your love language is not their love language. So, how can you be sure you’re speaking your child’s love language? How can you be certain that your child is receiving the messages your heart is sending? Well, you can take the quiz, here, to learn your child’s love language, and I recommend that you do. 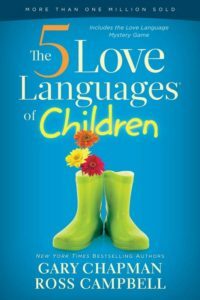 I also recommend that you read The Five Love Languages for Children, Dr. Gary Chapman. But I also have another suggestion. When you purchase Foundations for Literacy I, for $125, you’ll receive all of the materials you need to teach your 4-8 year old to read and spell words like vat, den, spill, shift, champs, and helpful. (Note- We do not promote sight words. Your child will learn to decode words using phonics!) Of course, we want our kids to LOVE reading books, so we ask that you purchase or borrow from the library, specific, high quality children’s books that serve as catalysts for each lesson provided. 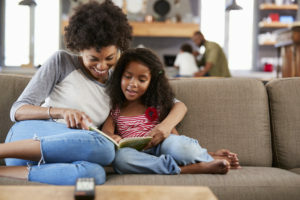 One of the greatest benefits of purchasing and implementing our Foundations for Literacy lessons is that you’re absolutely going to be speaking love to your child in ALL of those five love languages! Of course you’ll be side by side throughout each lesson, sharing high fives and delighted hugs (touch) . . .
Did you know that one thing that separates high achieving readers from average to low performing readers is whether or not parents consider themselves their child’s first and most influential teacher? Here’s the thing. You don’t have to know what to do. That’s where I come in. I will guide you along the way. Your soon-to-be reader is longing for this time with you- just a few times a week. Speak love to your child in all of the love languages, so it’s coming through- loudly and clearly.